When my children ask me what I'm going to make for dinner, I usually give a generic answer, as in chicken or beef or pork. I am not always prepared with a meal plan, especially in the morning (which is when the question usually pops up). Chicken is the usual sacrifice in my kitchen. It is the easiest to cook and no one says no to chicken. 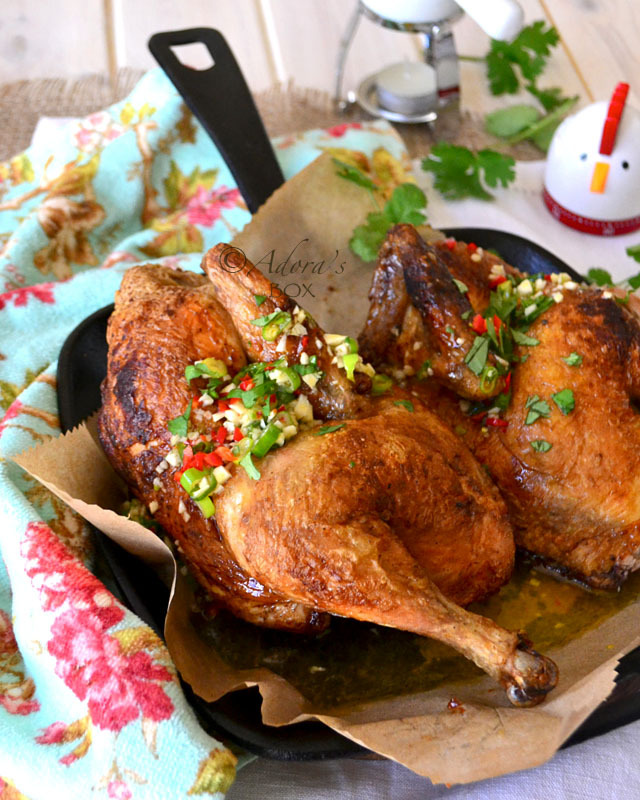 The key to making a great tasting chicken dish is to get a good quality chicken. It is very difficult to make a tasty dish out of a tasteless chicken. I feel as if I've cooked chicken a million times and they still expect something new and exciting. With all my been-there-done-that chicken ideas, I sometimes hit a blank wall. When that happens, I do the most logical thing: grind salt and pepper on it. Then I usually get ideas. What is done to it next will make all the difference. I decided on cooking it chicken diavolo style: seared, baked then drizzled with garlic and chilli butter. Diavolo means devil in Italian and diablo means the same in Tagalog. Devilled dishes have a characteristic fiery kick. The seared, browned and blistered chicken would taste good already. But since I was already at it, I pushed the boat further by making a butter sauce. It is not any old nor simple garlic chilli butter that went on this chicken. In Asian tradition, sauces has to be well flavoured, exciting and mouthwatering. Fish sauce, lime juice, chillies, garlic, spring onions, honey and chopped coriander leaves joined the butter to make a sauce for the chicken. There are a lot of wicked ways to describe this dish but I won't proceed. The best words for this dish is the oxymoron devilishly good. Season the chicken halves with the salt. Heat up a frying pan (preferably cast iron) and when very hot add the oil and butter. Put the chicken halves in and press down with a metal spatula. Pan fry the chicken until browned, about 3 minutes on each side. This stage is the key to this dish. The chicken should be well seared, browned and blistered before it goes in the oven. Transfer the chicken pieces to a roasting pan with a rack, adding half an inch of water to the pan so the drippings don't burn. Bake for 50 minutes to one hour, just until done. Drizzle with the spiced butter. Heat up the butter in a sauce pan. Take off the heat and add the chilli, garlic, lime zest and juice, spring onions, fish sauce, soy sauce, honey and black pepper all at once and stir. You can chop the chicken into serving pieces if you prefer. Drizzle with the spiced butter. Sprinkle with coriander leaves. 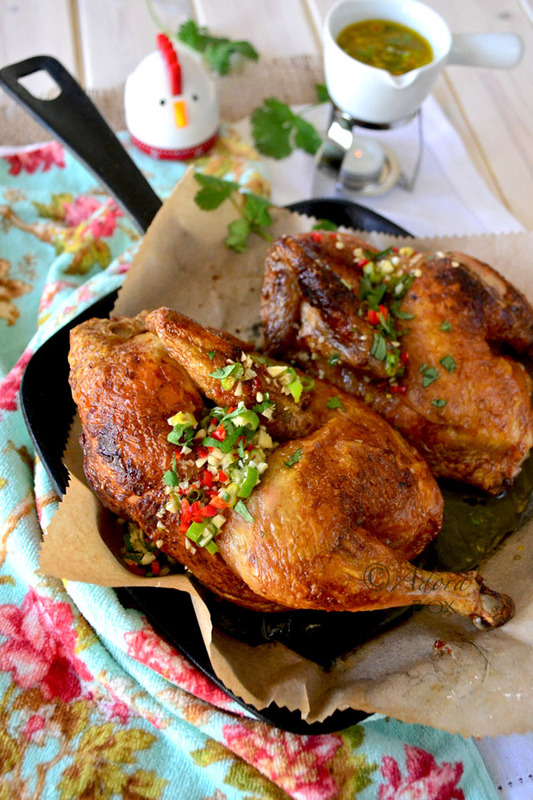 I have not stopped drooling over this chicken since I saw it on my Facebook feed. It's been far too long since I've prepared roast chicken. This will be the recipe to use when I do...and soon. Hi Jean. I hope you do try this one. It is really so simple but doesn't disappoint. Yeap, me too, every time I stop over to your new post, every dish is mouth watering and looking very delicious! Well, Christmas is drawing near, if I could not get a turkey, chicken is the best to go for it. 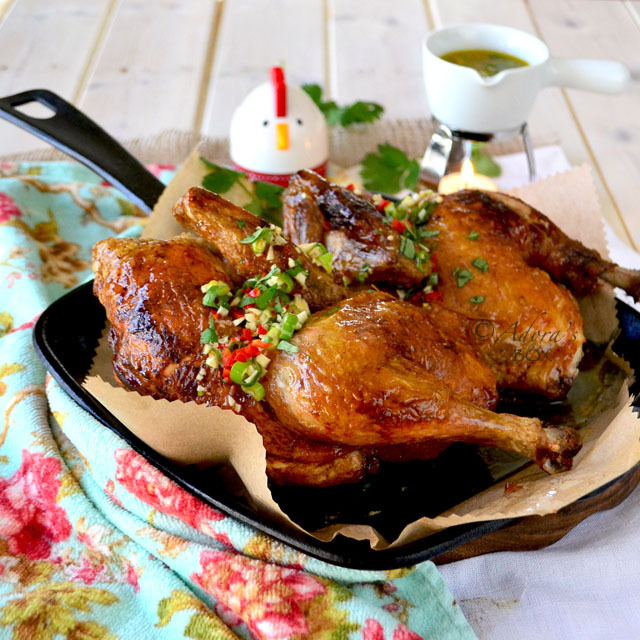 A simple ingredients in the roast chicken would still taste so delicious. Thanks for your visits and kind comments, Mel. I think Asians will prefer this over turkey because this goes well with rice. Yum, this sounds delicious. Thanks. I am exactly the same way and it is usually an hour or two before dinner when I finally decide what to prepare. Chicken is always great to fall back on. Your recipe sounds scrumptious and easy to prepare. In other word this is perfect for those days when I'm feeling uninspired. Thanks for sharing! Hi Nancy. Even as bloggers, we still have days when we don't know what to cook. This is the dish when there's nothing else. 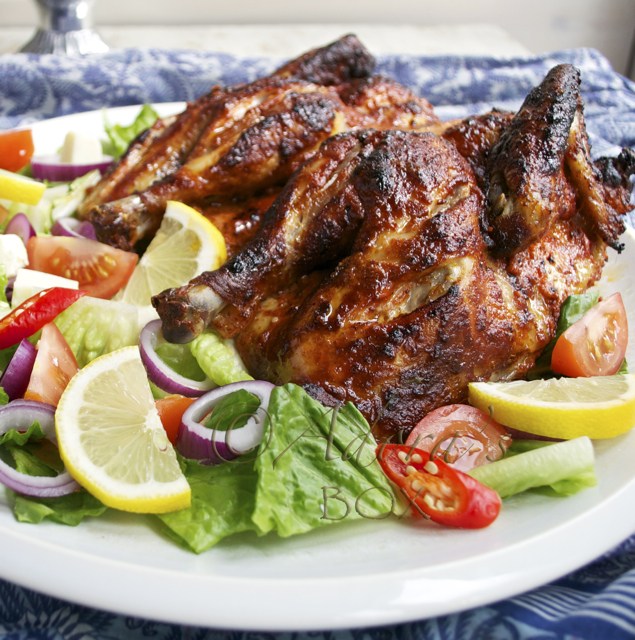 Seriously, your roast chicken looks awesome. I like the garlic and chili butter finishing.... Just lovely. Hi Chef! That game is probably from a much younger era. Hey Adora! C'mon... I'm not that old! LOL! "no one says No to chicken" - isn't that the truth!?! Same for this house. I love the way you cut the chicken in half to roast it. What a great idea! When we cook a whole chicken on the grill, I'll butterfly it, but in the oven, I usually keep it whole. Will definitely try halving it next time. Next time will probably be this recipe! I LOVE the crispy skin from the searing and the spicy butter - awesome!!!! Your lovely pictures make me very hungry for this! Thanks MJ! It is easier to sear chicken halves. There's also more surface area that gets browned. 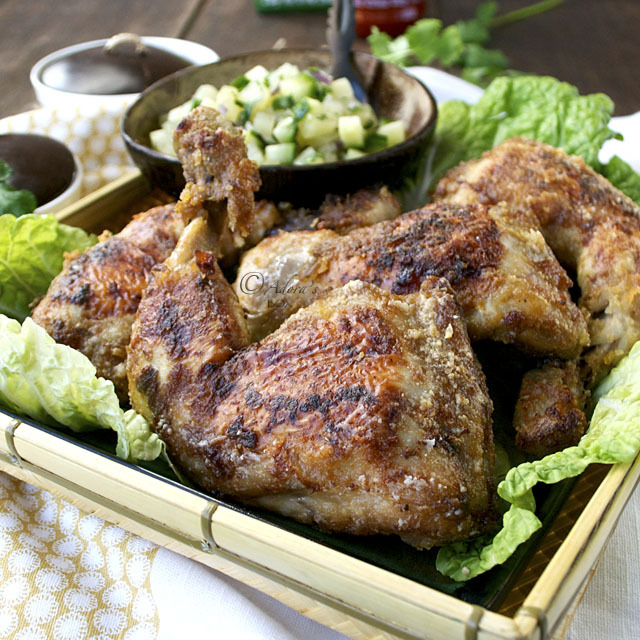 the spiced butter drizzled on top of the chicken...sounds delicious! Hi Ruby! It is the sauce that makes this dish delicious. I always love your recipes, but when you make chicken dish, I squeal for joy! 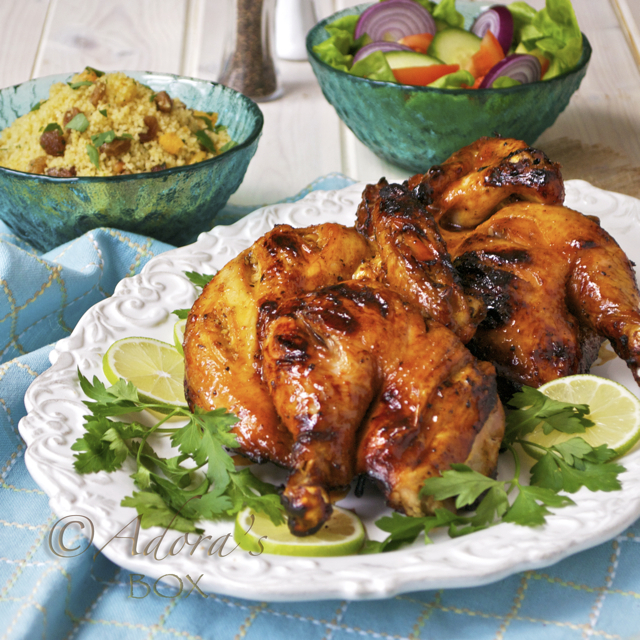 You really know how to cook delicious chicken dishes and we've enjoyed a few already. This is another great looking dish, Adora! Looks perfect! Hi Nami and thanks. You have delicious chicken dishes, too. I still remember your now famous chicken adobo on top9. Definitely going to have to try this chicken soon! I'm just drooling over that tasty spicy butter! This looks scumptious!! Definately going onto the 'to cook' list. This will be part of my insperation when I will be creating a chicken dish for a grilling competition I am participating in.